Yesterday the stock price of Capcom shares saw a decline of around 13 percent caused by a report on slowing in the console sales of Monster Hunter World. 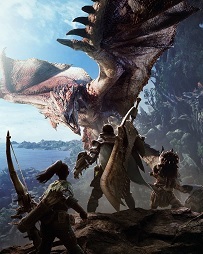 A release date for the PC version of Capcom’s shared world monster hunting epic, Monster Hunter World, has finally been announced, August 9, 2018. Capcom announced that they’ve had their most profitable year in history thanks in no small part to Monster Hunter World. Capcom announced today that Monster Hunter World has shipped 7.5 million units worldwide. This makes Monster Hunter World Capcom’s best-selling title in the company’s history. Monster Hunter World has beaten PUBG to place as the #1 top paid game on the Xbox Store. For the last 2 months PLAYERUNKNOWN’S BATTLEGROUNDS (PUBG) has been the #1 top paid game on the Xbox Store. The worldwide launch date for Monster Hunter: World on Playstation 4 and Xbox One has been confirmed for January 26, 2018.